We guarantee the lowest prices allowed on Osaki and Titan Brand Massage Chairs and Massage technology. 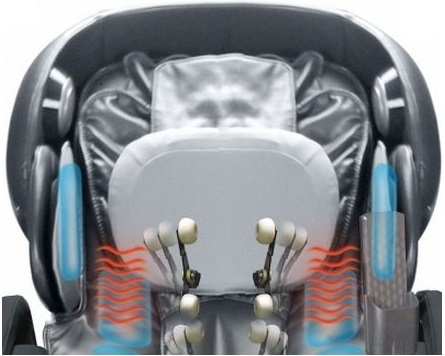 Osaki proudly brings some of the best and most reliable Massage Chairs in the world. These items are not only sleek and stylish but are also guaranteed to help you relax and unwind by relieving muscles soreness, aches, pains and much more. Call 888-486-9463 to speak with an Osaki Brand Representative or place your order and let us deliver your new massage recliner for free. The advanced S-Track Massager Technology ensures even, optimal, and therapeutic levels of massage contact. Traditional, massage recliners rely on the L-Track System. The S-Track is the latest in comfort technology advances. This allows the massagers to hone in on the difficult, hard to reach areas while still being conscious of everyone having a softer spot that requires a more delicate touch. Consistent levels of therapeutic massage can yield benefits immediately. Therapeutic massage can benefit Dull aches, pulled muscles, delay onset muscle soreness, neuralgia, and much more. After a long day, you deserve to come home and put your feet up and relax. You can take your relaxation to a new plane with an Osaki 7200CR. These quad head massager mechanisms feel as close to a natural human hand as possible during massage practice. The 7200CR features Zero Gravity Positioning and electric recline capabilities. This is because the most relaxing posture is a reclined posture in which your feet are elevated and your back is properly supported. Your body almost instantaneously relaxes as circulation is improved and your muscles release their tension because your body is supported and cradled. In addition to the Standard Computerized Body Scan that precedes the massage session, there is also an Auto Leg Scan Feature available. This ensures the chair analyzes your leg length to improve accuracy and efficacy of the air massage on your hips, legs, and feet. Each time someone sits down in one of these amazing relaxation devices, the chair will use the massaging mechanisms to conduct a quick analysis of body shape. As you encounter environmental stressors and other situations that tax you physically and emotionally, your body begins to reflect its stressed state. This model has massagers for your head and neck and shoulders. These are key areas that you begin to physically demonstrate stress through the form of hunched shoulders, headaches, and neck spasms. Allow your posture to relax, as you relax and unwind, in a brand-new Massage Chair with targeted air bag compressions for your key stress areas. This model features 48 bags for its Air Bag Compression Massage System. There are bags for your shoulders, legs, arms, feet, hips, and pelvis. These air bags inflate and apply a constant pressure to their target areas. The firm, consisten pressure stimulates the muscles and is intended to target key pressure points on your body. This maximizes the relief you feel after your massage session. The concentration of air bags in the legs region allows for the secondary stretching mode to grip your legs and gently and comfortably bend and stretch them. This improves bloodflow and is important for a general sense of well-being. 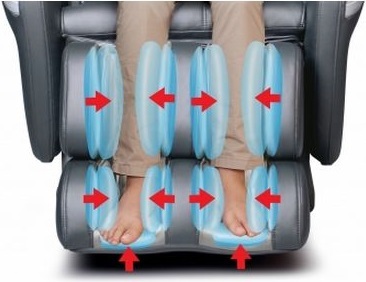 The feet areas also contain discreet shiatsu rollers under the sole to provide additional massage and stimulation. Topping the list of additional luxurious features: multiple heating pad elements, chromotherapy LCD lighting, Mp3/iPod connection capability, multi-layer pillow padding, removeable/washable headrest cover, 6 preset massage programs, multiple manual functions, easy to see LED screen Remote Control, and more.